For the briefest of introductions to the Sumer civilisation see our review of the HaT Sumerian Infantry. One of the many things Sumer invented was the wheel, and some time later the war chariot, the heavy four-wheeled version of which is the subject of this set. 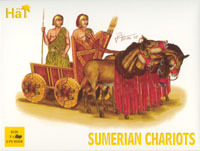 This vehicle was designed to charge at and break up enemy formations partly by its sheer impetus, and while much later chariots were to be larger, more nimble and more sophisticated vehicles the Sumerian chariot was the height of military technology in its day. The Sumerian chariot was quite narrow, heavy and ran on solid wheels. It had a high front with a quiver for javelins, but shorter sides and an open back. Unlike the later and much lighter Egyptian design this was a crude and simple device, but it has been well modelled here and there are no accuracy problems at all. On our examples we found a very curious feature, which was that the properties of the plastic varied to some extent. The material is soft, but we found that some copies of the model fitted together quite well while others were of a softer variety and were considerably more difficult to assemble. Where the plastic was particularly soft we found it quite difficult to place parts together, most particularly the wheels. However where the material was marginally harder this was not a problem. Just as importantly, we found that the slightly harder material could be posed, at least to some extent. This is important because the central pole of the chariot needs to be raised in order to reach the shoulders of the draught animals, and with the softer plastic this was just not possible. Where the slightly harder bendable plastic is used the model is not particularly difficult to construct, and it takes glue well, but the softer material is much more tricky. We have been unable to ascertain why this variation in material might have occurred. The method of construction is not complex although we would suggest the axles are shortened as the original chariot seems to have had wheels very close to the body. Otherwise the chariot is fine, but there is a problem with the animals that pull it. All the ancient sources seem to agree that such vehicles were pulled by asses or mules, but the animals in this set have the look and the stature of horses, an animal which the Sumerians had little or no knowledge of (there were no wild horses in Mesopotamia). For many this will seem like a trivial point, but perfectionists may want to source their own animals from elsewhere. For the animals the sculptor has provided something that looks like strips of cloth or leather across their chest. The two main sources for this chariot, the Stele of Vultures and principally the Standard of Ur, show small tassels around the collar - clearly a decorative feature. In succeeding modern illustrations of this they seem to have grown until now they look like some form of protection for the animal. Based on the primary evidence available we find no reason to support this suggestion, although of course there is no way anyone can claim it was never done and indeed logic would suggest such protection would be reasonable. The narrow chariot had room enough for only two crew - the driver in front and a warrior behind. HaT have provided these two individuals, both of whom are appropriately posed and dressed. They have minimal bases in order to allow them to fit inside, although they do successfully stand on their own. Depending on the material this model is fairly simple or very tricky to put together, and if the plastic is not bendable then the yoke is too low for the provided animals, causing the front two wheels of the chariot to be noticeably raised if smaller asses are not substituted. HaT could have done a better job with the animals, but once put together this is a nice little model.